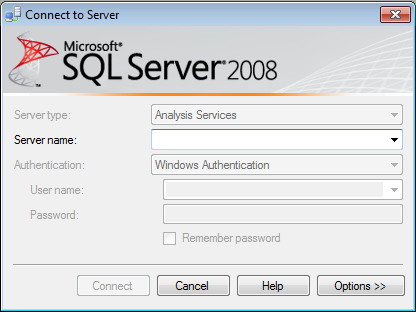 Okay, this may be an insanely stupid question, but how in the world do I connect to Analysis Services in SQL Server 2008? Basically, I have no idea what to put as my Server Name. AFAIK, there's no Analysis Services for SQLExpress. According to http://msdn.microsoft.com/en-us/library/cc645993.aspx Analysis Services is included only in Enterprise and Standard edition. If you did have Analysis Services, then you should be able to connect to it with the same name(s) that you use for the normal data services. Also, it would show up as a separate explict service in the configuration manager, just like the Agent or the data services.